I'm trying to get the Baltimore in career mode but irrespective what I do, it crashes the sim. Just wondering if anyone has the Baltimore up and running. 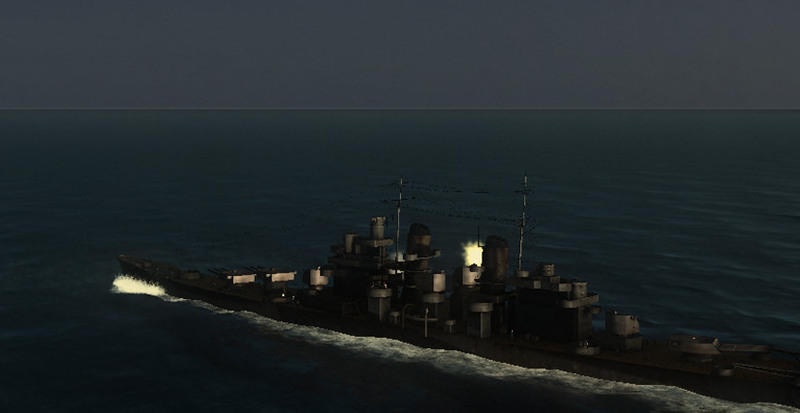 It's the Baltimore class heavy cruiser Beta1.0 located on page 3 of the downloads link. The mission starts at 0700 hours (hence the lighting), and the CL Naka (yes, I'm a chicken when in a surface ship) at 10K yards is barely showing over the horizon. 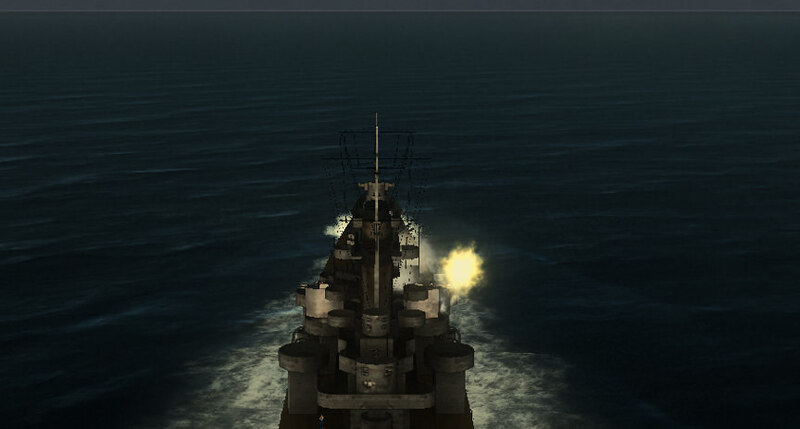 The secondaries open up at about 8500 or so, and I could get one shot from the 8" turret off before we got the "She's taking on water and going down, sir!" Less than two minutes in FotRSU (where I got the shot off and actually hit the Naka), and less than 3 minutes in Stock... One has to be careful in FotRSU, because of the Long Lance - Don't get too close! The mod does overwrite some important files and would need re-working if you go to use it in FotRSU, but if that's all you're going to do, it works fine. I wasn't able to test it long enough to see if it quite shooting the five inchers after five minutes... they were too efficient - and I never got to try the torpedo. Yes, there is a torpedo on it. Oh! Forgot to mention when doing the Campaign... It has a slightly different naming convention. Be sure of your UPC versus Flotilla typing. Edit: I take that back. It does crash on mine in Campaign also... something conflicts, or else my double-checks of my double-checks for typos needs double-checking... - I did notice that it had Type10 and Type14 torps available as "upgrades" in-base, but that 18s were loaded in the two slots. It may well be a pre-v1.5 ship. Looking at it out of curiosity, it's giving me nightmares. It's been butchered up pretty well. But it does have me curious as to the minimum to get a surface ship playable. Yeah. Very strange beast. I cleaned up the folders, and re-mapped the IDs just in case it was that, and re-did the CareerStart and Flotilla along actual date lines, and unless I'm missing something obvious (very understandable)... 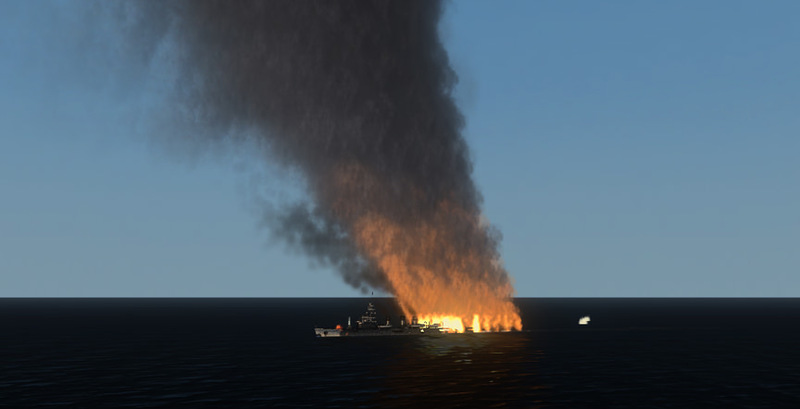 I re-did some of the other files, and now the Naka lasts four minutes, but... the Baltimore still crashes in campaign. Equipment? Hard to say yet. I'm not sure of the authors intent in their plans for making it playable. Looks like they based it off of another playable unit though. Last edited by propbeanie; 12-05-2018 at 09:08 PM. Reason: wrong! - again! It is a mystery to me. I've tried everything I could think of. The campaign process works when I select it but as soon as I start the campaign it crashes. I even renamed all the node files in the USA_Baltimore.dat file from Iowa to USA_Baltimore and made no difference. I have a feeling that the textures may well be from SH3 or SH5 and not rendering. Thing is the original download has a lot of folders missing. I think this one is better off in the scrap yard myself. Since you're having so many problems with playable surface ships I've decided to expand operations of my "shipyard." Made a template to use for making playable surface ships and am constructing a new Baltimore for use. Well I think it's finished. Commissioning ceremony to be held tomorrow. Last edited by Fearless; 12-06-2018 at 09:50 PM. Why, I even see a splash of champaign on the bow sprit!